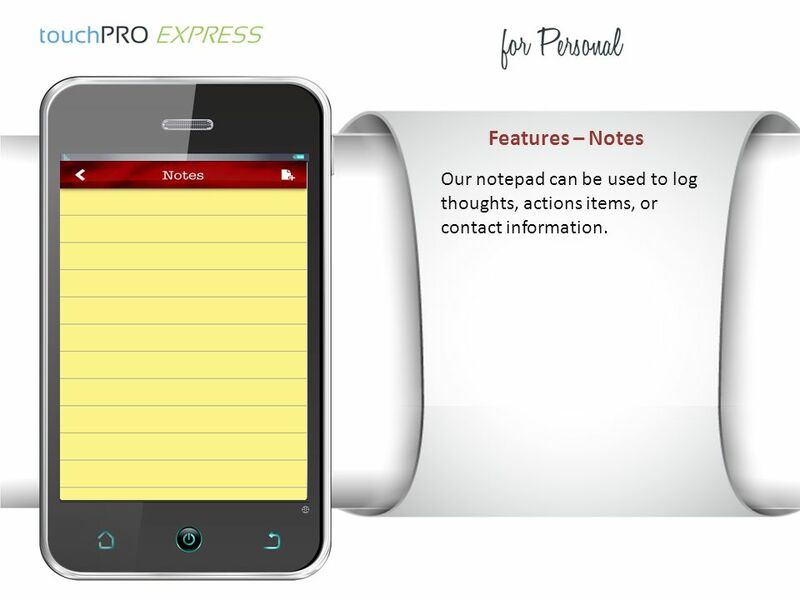 What is touchPRO EXPRESS? touchPRO EXPRESS is a way for select industries who meet certain criteria to be able to get a mobile app at a low cost and have. 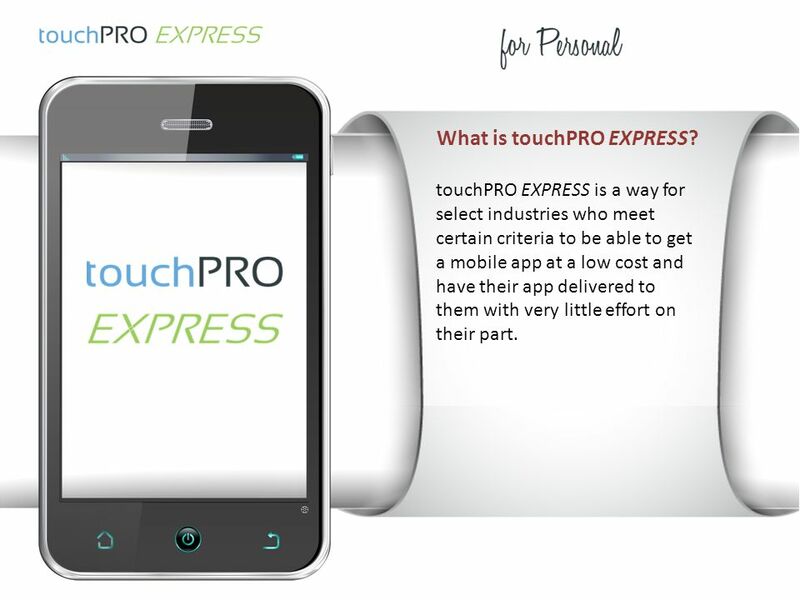 1 What is touchPRO EXPRESS? 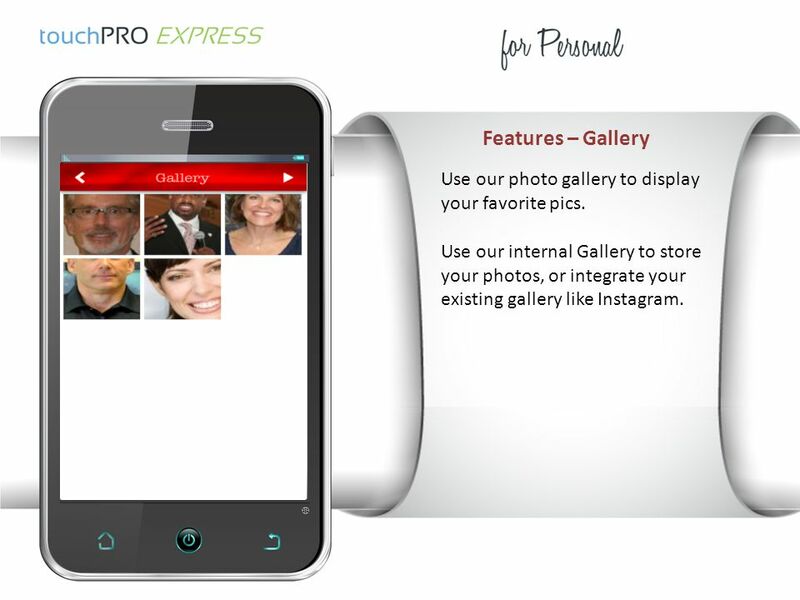 touchPRO EXPRESS is a way for select industries who meet certain criteria to be able to get a mobile app at a low cost and have their app delivered to them with very little effort on their part. 3 Introduction If you want to see our Associations demo in action, contact the person who referred you to this webinar. 4 App Build Process You just supply a high quality photo and or version of your logo, a link to your website (if available) and a few details about yourself. 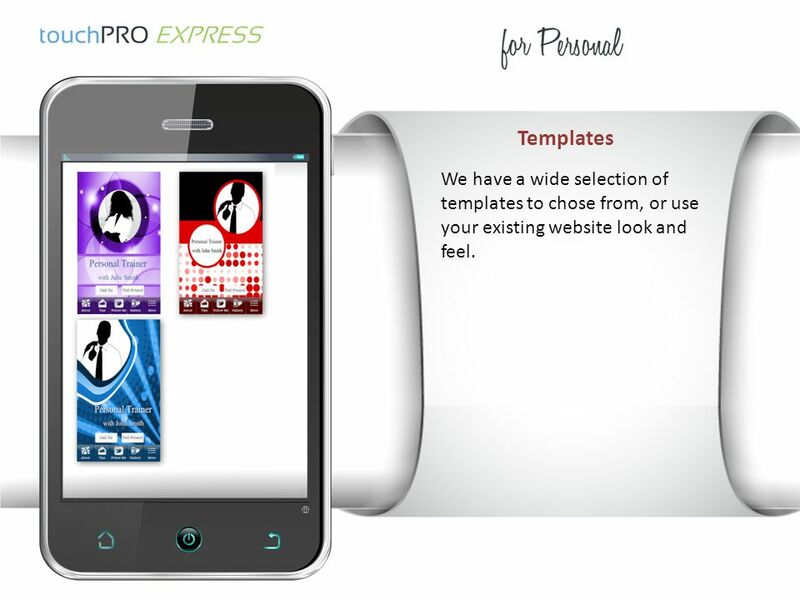 You can select from our pre- designed templates for your app design, or we’ll use images from your website. After that, we do the rest. 5 Features We will build an app with the standard features that individuals want, along with the native phone features that give the app value. We do the tasks to get the app published, after that, you can enhance your app with updates and added features. All of the standard touchPRO features are available for use. 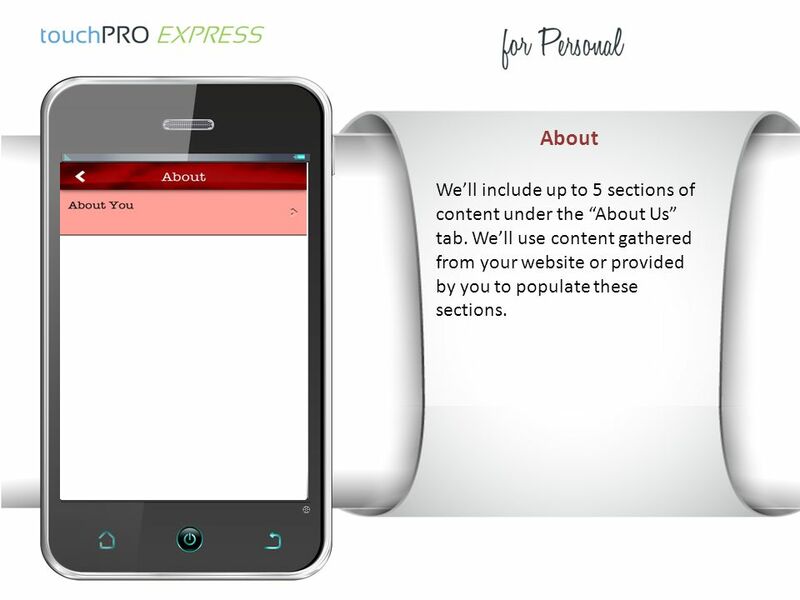 6 About We’ll include up to 5 sections of content under the “About Us” tab. 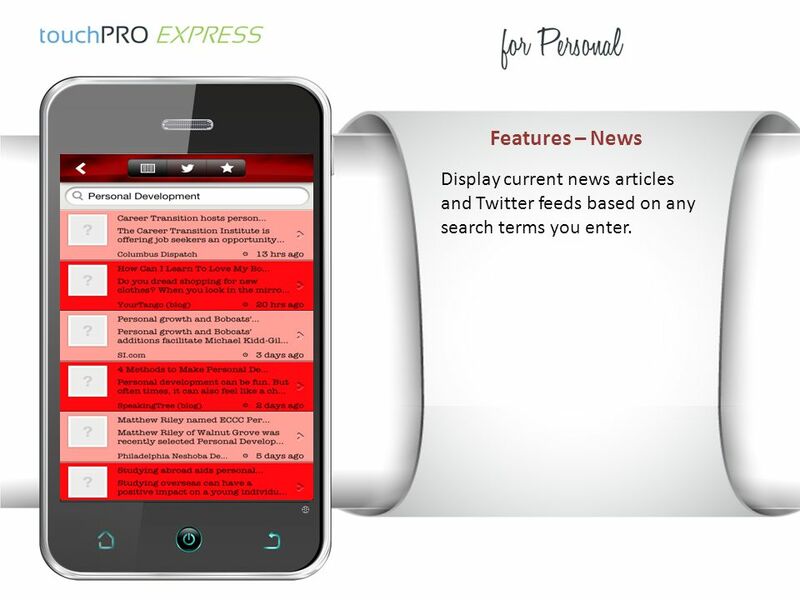 We’ll use content gathered from your website or provided by you to populate these sections. 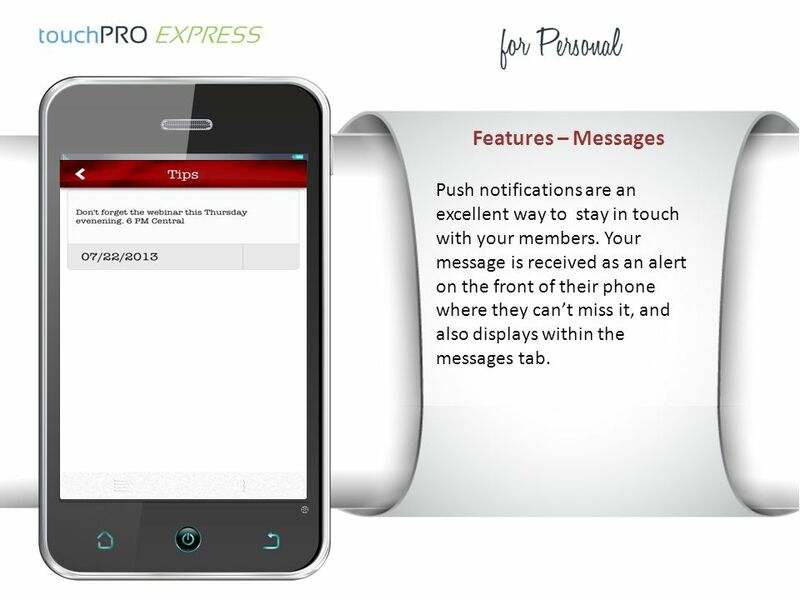 7 Features – Messages Push notifications are an excellent way to stay in touch with your members. Your message is received as an alert on the front of their phone where they can’t miss it, and also displays within the messages tab. 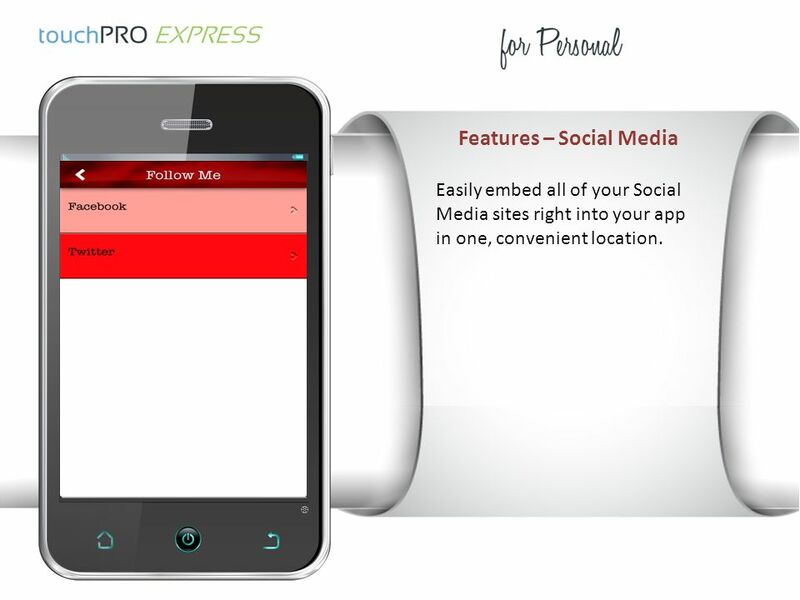 8 Features – Social Media Easily embed all of your Social Media sites right into your app in one, convenient location. 10 Members can have a calendar of all events related to the church. Our events calendar lets you enter one time events, or if an event happens at the same time on the same day every week, enter it once as a recurring event and it will automatically display for each event instance. 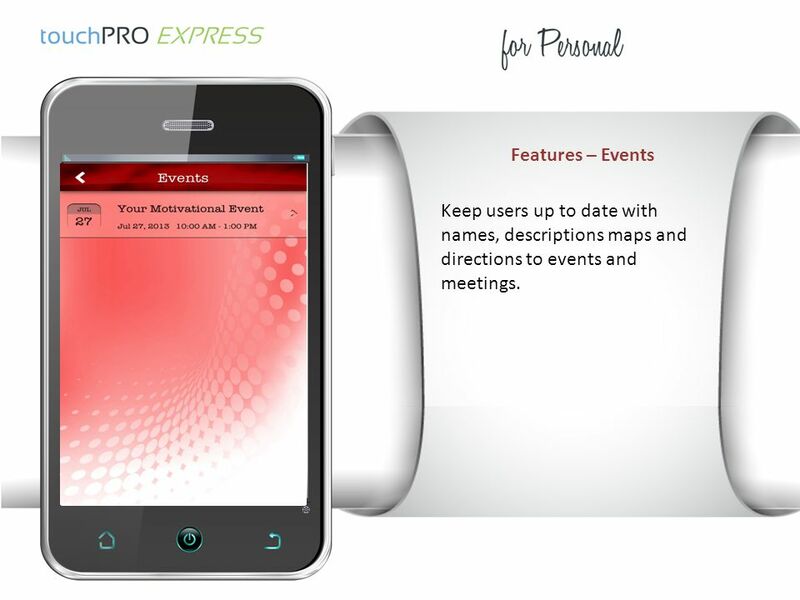 Features – Events Keep users up to date with names, descriptions maps and directions to events and meetings. 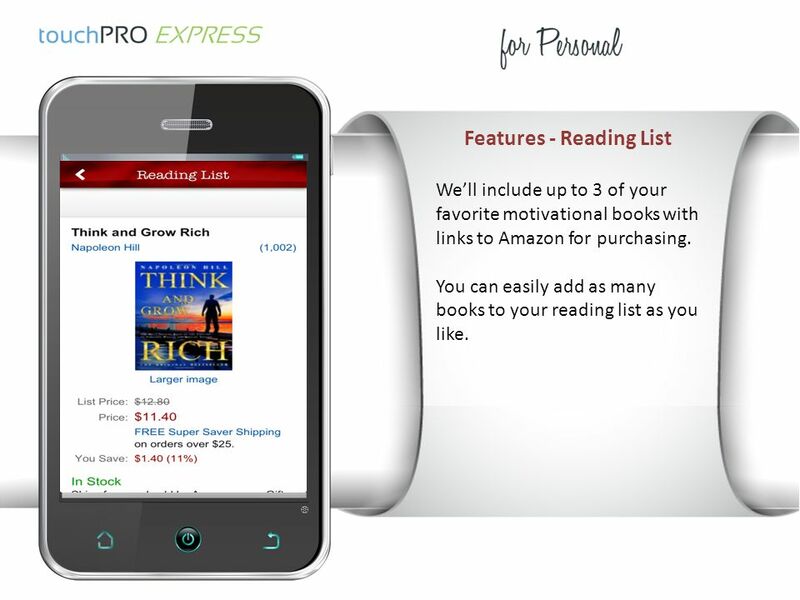 11 Features - Reading List We’ll include up to 3 of your favorite motivational books with links to Amazon for purchasing. You can easily add as many books to your reading list as you like. 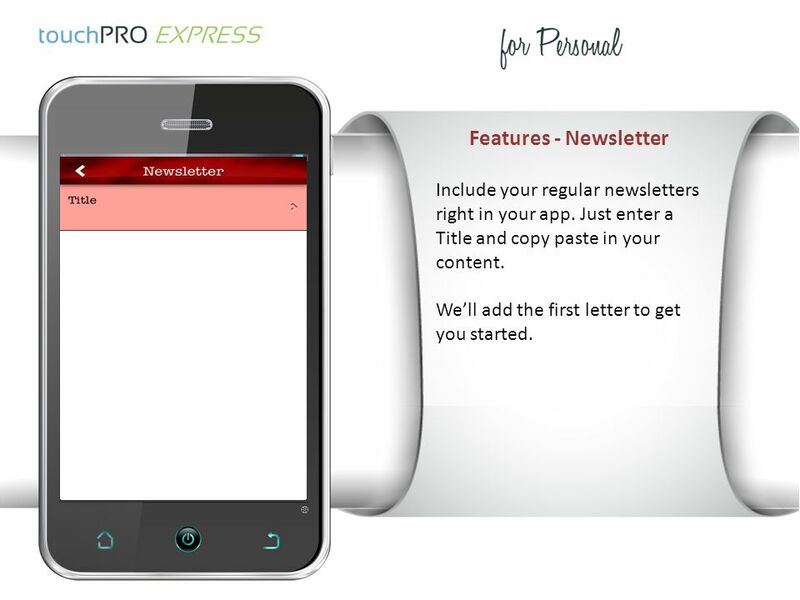 12 Features - Newsletter Include your regular newsletters right in your app. Just enter a Title and copy paste in your content. We’ll add the first letter to get you started. 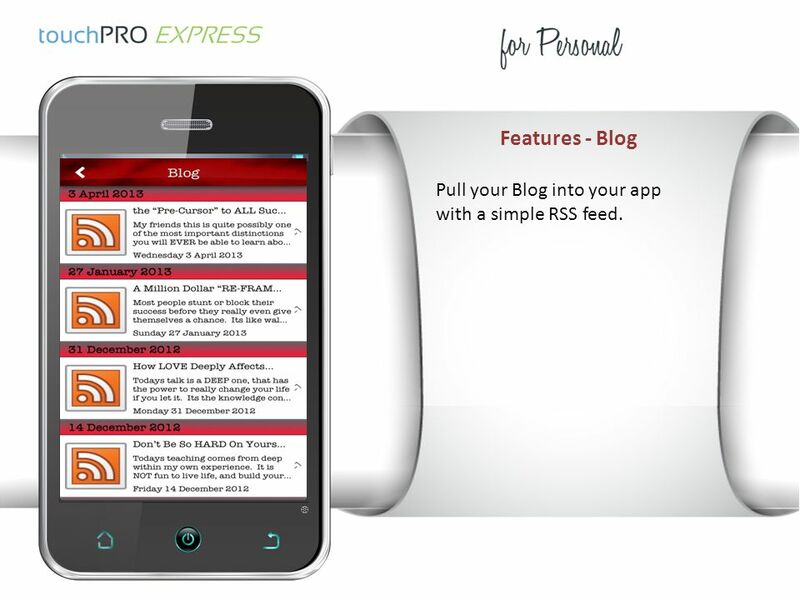 13 Features - Blog Pull your Blog into your app with a simple RSS feed. 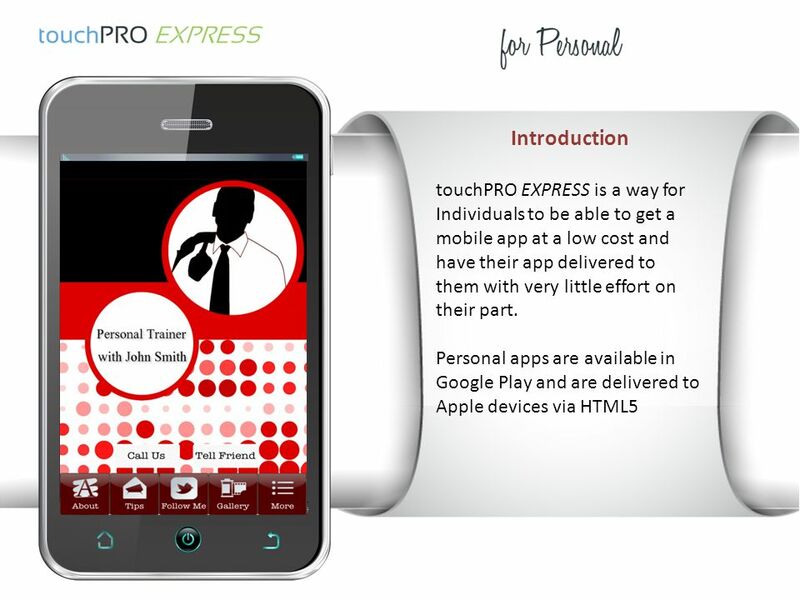 Download ppt "What is touchPRO EXPRESS? touchPRO EXPRESS is a way for select industries who meet certain criteria to be able to get a mobile app at a low cost and have." Social web case study: solving problems for your institution Jo Alcock Evidence Base Birmingham City University. Netvibes Creating your own dashboard as a news-stand. Microsoft ® Lync ™ 2010 IM and Presence Training. So You Want a Web Presence? Choosing the right Tufts tools for the job. Better information. Better decisions. RSS Really Simple Syndication Tutorial. Peak Net Ltd Unit 7, Rock Mill Business Park, Stoney Middleton, Derbyshire S32 4TF // // Creating Your. This document is for informational purposes only. MICROSOFT MAKES NO WARRANTIES, EXPRESS OR IMPLIED, IN THIS DOCUMENT. © 2007 Microsoft Corporation. All. NEW PRODUCT INTRODUCTION: SalesLink TOUCH April 2015. Make Your Site Do More: Using Plugins If you can think of it, there’s probably a plugin that does it* * And we probably already have it installed. 1 of 7 This document is for informational purposes only. MICROSOFT MAKES NO WARRANTIES, EXPRESS OR IMPLIED, IN THIS DOCUMENT. © 2007 Microsoft Corporation. Making the Most of Your Website A Guide for Business Coaches. SOCIAL NETWORKING APP FACEBOOK. WHAT IS FACEBOOK Facebook was created in 2004 by Mark Zuckerburg and was first used on computers. It was one of the first. Website Introduction  Plant a Seed, Watch it Grow web guide  Request a Garden Consultant  Explore Existing Gardens  Grant Calendar Log on to our website. Welcome Teachers! - WELCOME TO TEACHER WEBSITE BUILDING 101.